I'm joining Chari for her weekly meme Sunday Favorites over at Happy To Design with this post from this week last year. The lavender is blooming again right on schedule, as are the Lady Banks roses. Here are some pictures of my "lavender blue" taken in my garden. clippers and did a job on a few of the many lavender plants that line the driveway. 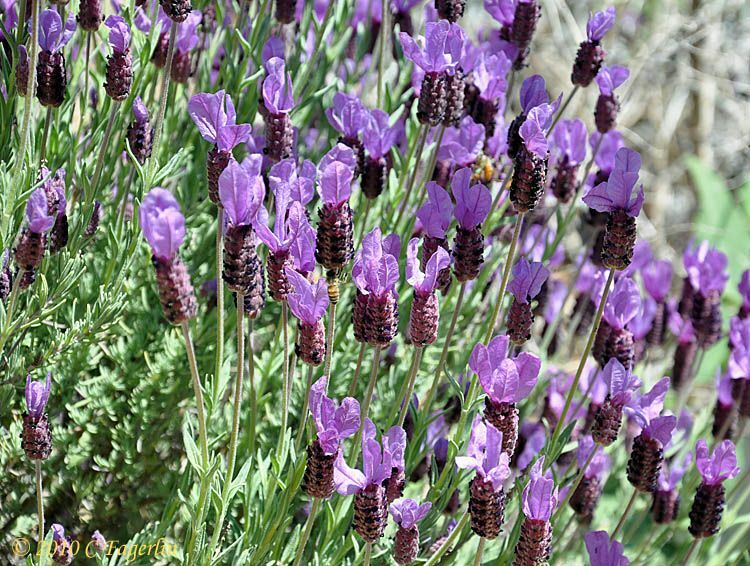 Lavender makes wonderful sachet and helps ward off scorpions! I also hang bundles in the laundry room and in the closets. There is something so special about the memories that flood over me when I open a drawer with lavender sachet. It always speaks very softly and says, "Grandma's house." I brought in a couple of bundles to check, not ready yet for making sachet, but soon! Looks like you have a large number of lilacs, just beautiful. The scent is so memorizing. Beautiful pics too. Oops!! I meant lavendar---silly me. I love lavender! Not only is it beautiful to view, but it's wonderful to smell. It just engages all of the senses. And so very French! Oh I am so jealous! 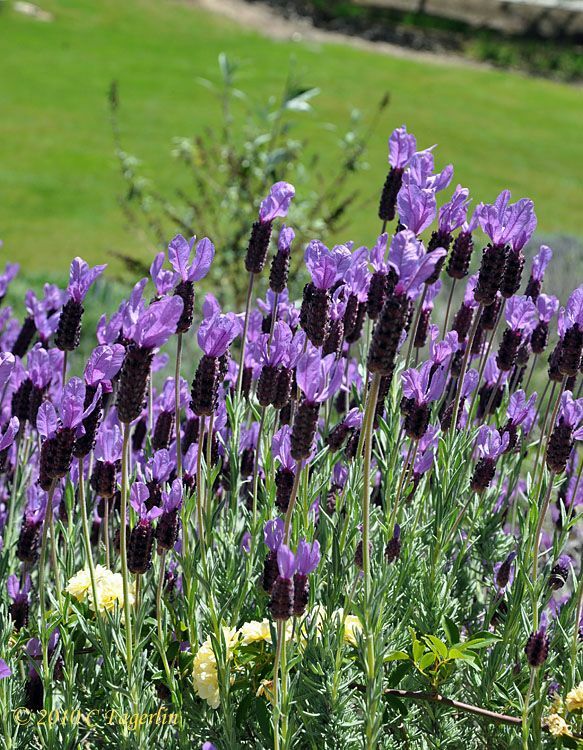 I love lavender but have never grown it! Not sure if we can even grow them in our climate here in SC and the clay. Yours are just beautiful! Love the smell of lavender! Your lavender is just beautiful. Great pictures also of the Lady Banks. Now I know what to do with my lavender "blue"!!!! Love the music, a delightful post!!! Lavender is just plain yummy! 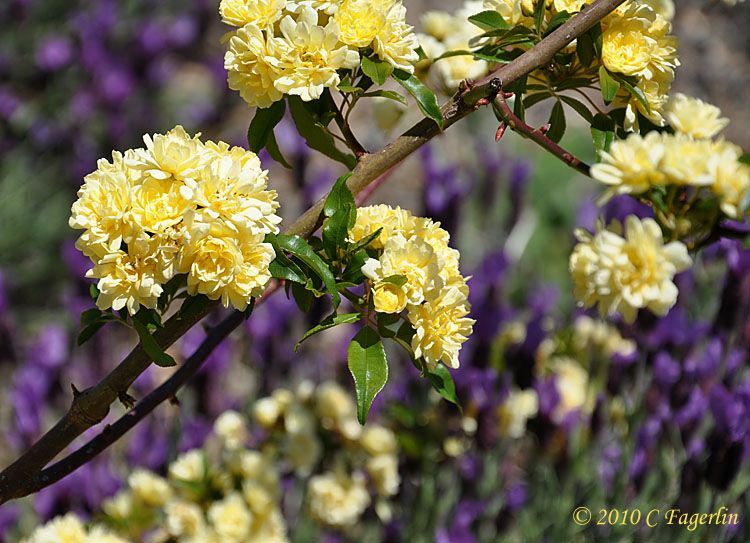 Here in California it can be pruned numerous times during the growing season for re-bloom, doesn't mind our heavy adobe clay soil, needs little water once established and bugs and deer don't like it at all. The perfect plant. Ann - my pet peeve with this blog format is that you can't go back in and edit comments. Sometimes my fingers just don't connect with what my brain is transmitting and my spelling is just plain bad. Maybe someday they'll realize that our minds and fingers need a little editing gadget! I remember Burl Ives and Lavender Blue. It was nice to hear it again. And I think your lavender is a lovely choice for Blue Monday. Today is my first time to play along with this blue party and I went with blue dishes. 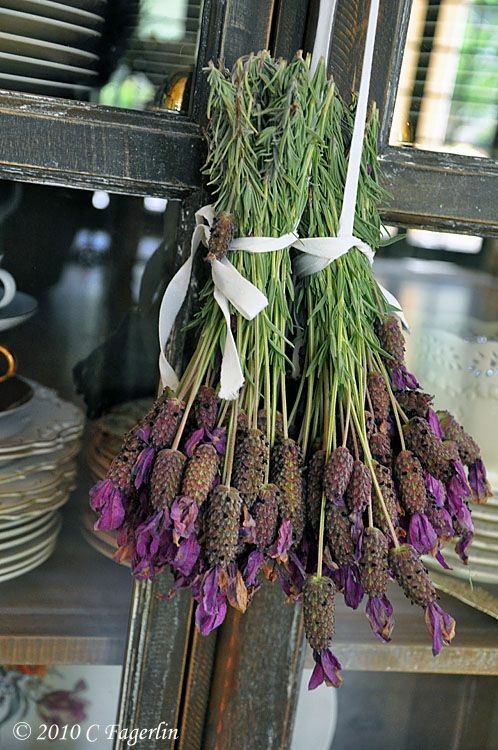 Do you just sew little bags for your lavender flower heads to make the sachets? My great-grandmother always had those in her dresser drawers and the fragrance brings back wonderful memories to me. Candy, your lavender is stunning, beautiful photos. I have one little bush, hope I get some blooms too. I remember the song and the singer; I also remember MOST of the words! Happy Blue Monday, Candy. Wow they are pretty flowers. Happy blue Monday. Oh heaven! Your blue makes my heart go pitter pat. Well done! I love lavender. Yours is so pretty. Thankfully here in PA we don't have to worry about scorpions! Such a beautiful post!! The colors are gorgeous!! BABY sox - they work great! A simple square of cloth tied with a pretty ribbon. And my newest favorite is a little off white cotton bag thingy that Wisteria includes with every order to hold your invoice. Comes with a draw string and is perfect! I find that I refurbish or add more sachet if they are simple things rather than something that is too precious on its own. Empty the baby sock or shake out the little piece of cloth, add fresh sachet and you are done! Thanks for all your lovely comments, please stop by again to visit! They are very stunning, im sure you place smells like lavender right now. great shot, happy Blur monday! Thank you both for stopping by. With all our winter rain this year, the lavender is just beautiful. Your lilacs are just beautiful! I love your post and the smell of lilacs too. Your photos are great! Thanks for sharing. I'm at Chari's, Sunday Favorites. My friend, I am sooo envious! I have wanted to grow lavender for some time now. I really do need to just get a few plants at the store and see how they will do in our area! I can just imagine the aroma! Your Lady Banks roses are gorgeous as well! Oooh...I bet it smelled just heavenly at your place while these pretties were blooming! Thank you so much for sharing this sweet post with us for the Sunday Favorites party today! Beautiful photos...by the way! If only we could grow lavender easily here! Your crop is super!